Definition: The Performance Appraisal is a periodic evaluation or the assessment of the employee’s job performance against the pre-established standards such as quality and quantity of output, job knowledge, versatility, supervision, leadership abilities, etc. Rating Scales: The numerical scale is prepared that represents the job evaluation criterion such as the output, initiative, attendance, attitude, dependability, etc. and ranges from excellent to poor. Thus, each employee is given the rating based on his performance against each set criteria and then the consolidated score is computed accordingly. 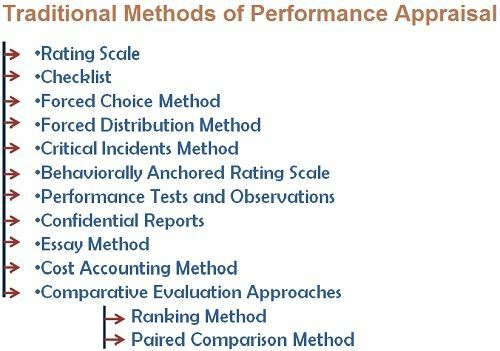 The rating scales are one of the easiest traditional methods of performance appraisal and can be applied to any job. Checklist: A checklist of employee traits in the form of statement is prepared where the rater put a tick mark in “Yes” or “No” column against the trait checked for each employee.Once the checklist gets completed the rater forwards the list to the HR department for the final evaluation of the employee. Forced Choice Method: Under this method, the rater is forced to answer the ready-made statements as given in the blocks of two or more, about the employees in terms of true or false.Once he is done with the list, it is forwarded to the HR department for the final assessment of the employee. Forced Distribution Method: This method of performance appraisal is based on the assumption that employee’s job performance conforms to the normal distribution curve i.e. a bell shaped curve.Hence, the rater is compelled to put employees on each point on the scale. It is seen that cluster of employees is placed at the highest point on a rating scale. Critical Incidents Method: Under this method, the critical behavior of each employee that make a difference in the effective or non-effective performance is recorded by the supervisor and is taken into consideration while evaluating his performance. Behaviorally Anchored Rating Scale: The descriptive statements about employees’ behavior, both effective and ineffective are put on the scale points, and the rater is asked to indicate which behavioral point describes the employee behavior the best. Field Review Method: Under this method, the performance evaluation of an employee is done by someone who does not belong to his department or is usually from the corporate office or the HR department.The outsider reviews the performance of an employee through his records and holds interviews with the assessee and his superiors. Performance Tests and Observations: The test either written or oral is conducted to test the knowledge and the skills of employees. Sometimes the employee is asked to demonstrate his skills in the given situation and then he is evaluated on that basis. Essay Method: Under this method, the detailed description of the employee performance is written by the rater. The performance of an employee, his relations with other Co-workers, requirements of training and development programs, strengths and weaknesses of the employee, etc. are some of the points that are included in the essay.The efficiency of this traditional method of performance appraisal depends on the writing skills of the rater. Cost Accounting Method: In this method, the employee’s performance is evaluated in monetary terms, i.e. how much cost company is incurring on keeping the employee and how much he is contributing to the firm in terms of his output.